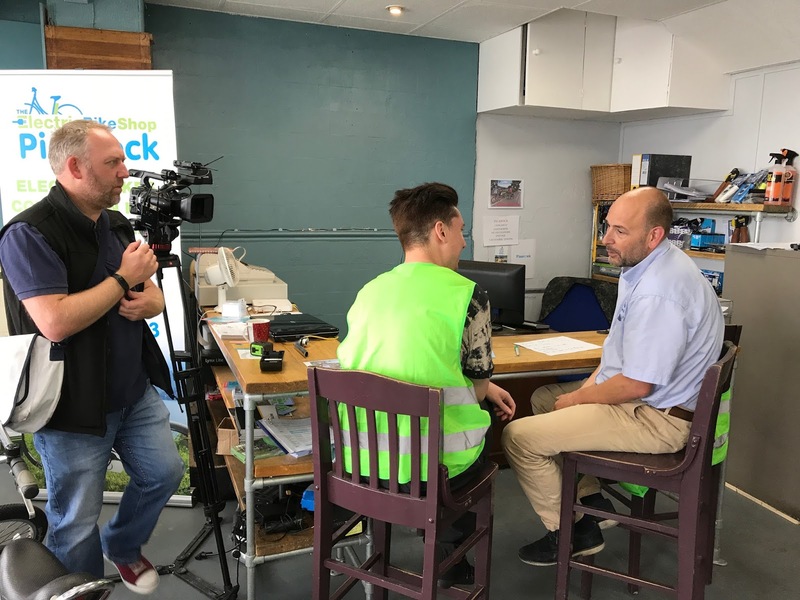 Yesterday I was out and about in North Lincolnshire with Estuary TV. Batribike was invited to take part in a programme about cycling around local communities. 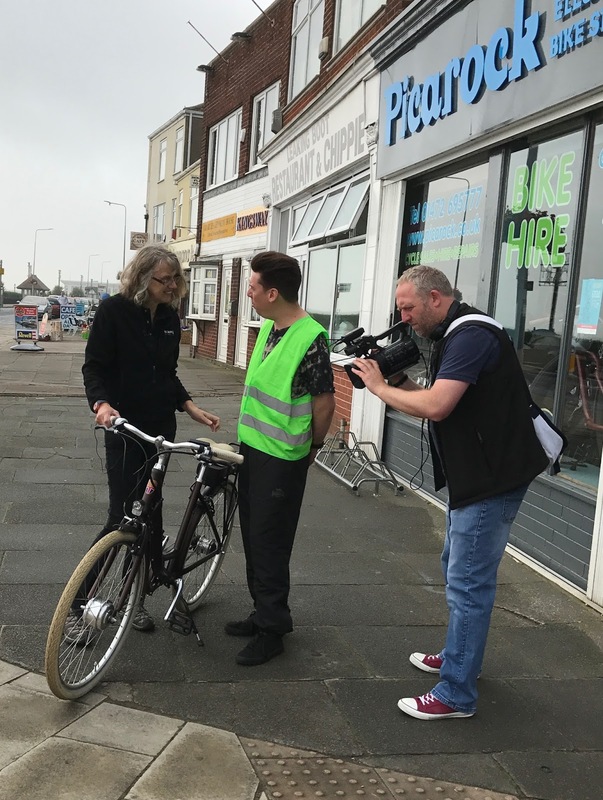 Last week Estuary TV had been working with conventional pedal cycles and had been filming with Batribike stockist, Rusty’s Cycles, in Scunthorpe. This week it is all about electric bikes. I went down to Picarock our local dealer in Cleethorpes to meet the team. 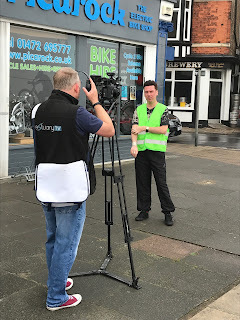 The presenter, Luke Adams, will be riding the Batribike Omega in Cleethorpes and surrounding area for two days. 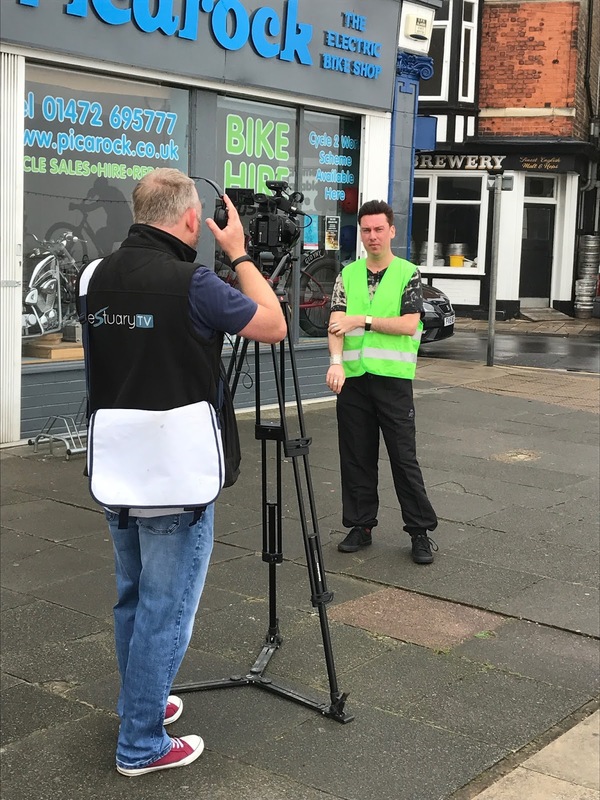 He will be seeing local sights and interviewing local people on his journey. 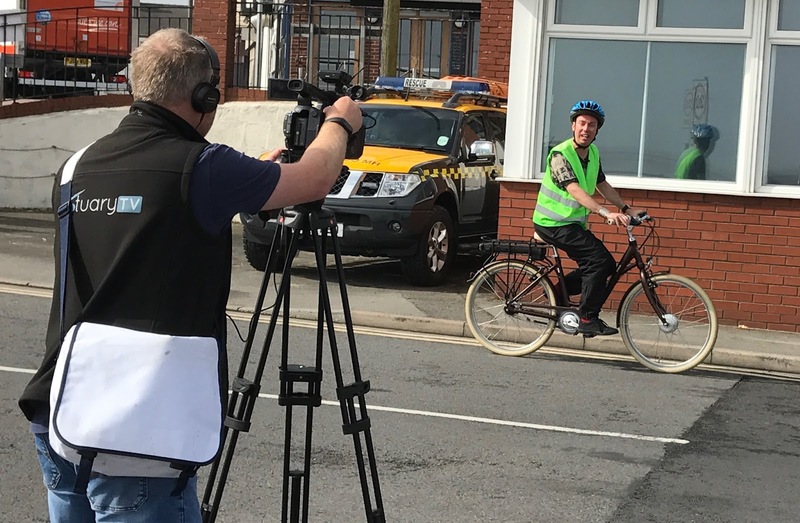 Filming started outside with Luke telling viewers that he would be using an electric bike for this week’s adventure. He then went inside the shop to interview Richard Soulby of Picarock. Moving outside, I showed Luke the finer points of the Batribike Omega and was filmed talking about Batribike’s ten years in the electric bike industry. 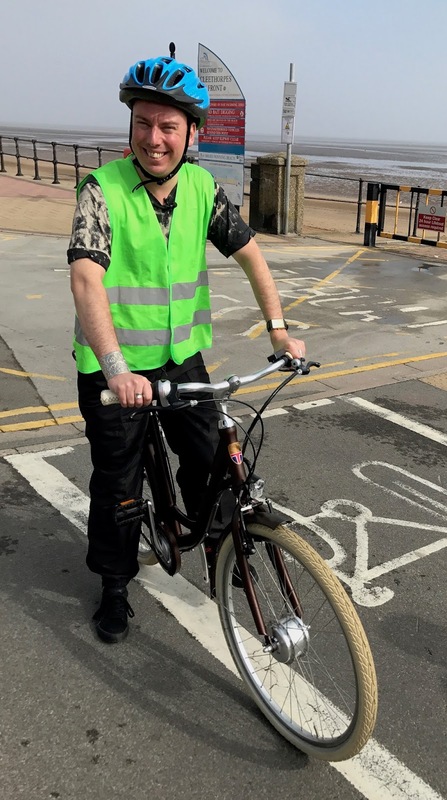 We moved over the road to the fantastic cycleway along the prom at Cleethorpes, and Luke had his first try on an electric bike. He loved it! Not only was it easy to ride but comfortable too. Luke also loved the on-trend brown and cream colours of the bike. 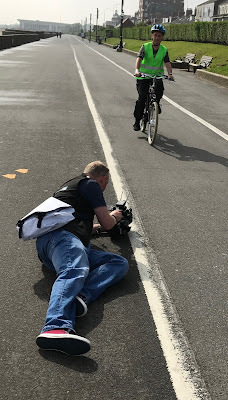 Filming then of the bike in action and the fantastic traffic free cycle lane. A production meeting with Luke still on the Omega. Riding past Cleethorpes Coast Guard Station and reporting to camera at the same time. I had arrived at PicaRock on a misty drizzly morning but the sun had soon come out and I had had an enjoyable morning. Luke and the Estuary TV team were off to Cleethorpes Pier for other interviews. I will be back in Cleethorpes this afternoon and am looking forward to meeting up with them again. Many thanks to Richard and Mick at Picarock for their hospitality. 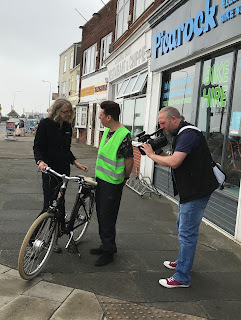 Today I have just been to collect the bike and was delighted to meet up again with Luke and Neil the Cameraman and Director. 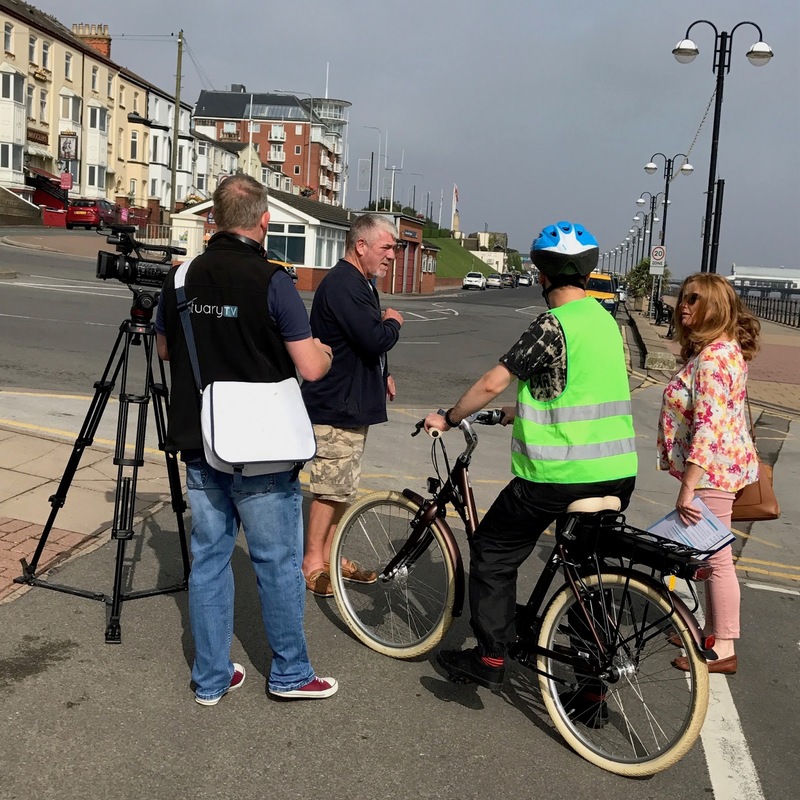 It was great to hear that they have embraced the idea of electric bikes and enjoyed their two days with the Omega. This year was the fifth anniversary of one of the world’s leading cycling events. It is an event that has something for everyone. Whether you are a seasoned cyclist, a first time rider on a Boris Bike or a youngster on a strider bike. Some of the Batribike team went along to enjoy the Prudential RideLondon FreeCycle event. Eight miles of London Streets are closed to motorised traffic to allow cyclists to enjoy the iconic landmarks and festival feeling that goes with the event. We parked near St Katherine Dock and met our other riders who had come by train. I love looking round the dock here. It has such a lovely quiet village feel yet is just a few yards from the Embankment and Tower Bridge. After a few pre ride pictures of the bikes we set off. Under Tower Bridge and along the cobbles, past The Tower, and onto Lower Thames Street. The Cycle Superhighway runs along here and we crossed the dual carriageway to join it. What a great cycle lane this is, completely separated from the fast moving traffic. We soon turned off and headed up to the Monument. The sun was shining and we were all excited to be in London. We joined the FreeCycle route here. The route is directional, when you have 70,000 riders on the road it is best to have them all going the same way! We travelled along the Embankment to Westminster and up Birdcage Walk to Buckingham Palace. The crowds on the pavements were huge and there was a lovely festival atmosphere with riders ringing their bells and waving flags. As always my favourite part was riding up the Mall to Trafalgar Square. We saw a cycling sofa – people pedalling recumbent style. It had a large speaker and the riders were beat boxing. Another high point was the ride round the new financial buildings – the Gerkin looks so much bigger up close. After two circuits it was time to go. Another brilliant RideLondon! I thoroughly enjoyed my stress free ride on the Perdu. My injured knee coped very well with 16 miles of riding and most of the time I was on the lowest level of assistance. I have the date for next year’s event noted in my diary.